Our expert team at Great Northern Builders (GNB) provides safe, effective ice dam removal in the Twin Cities. We use equipment that will not damage your roof or shingles. Ice is carefully removed by hand and in some cases a roof melt product is used which is safe and does not cause damage to your property. The result is a roof clear of ice and snow, and no more ice dams. We specialize in preventative maintenance and removal of snow and ice dam buildups. Our quick-response team is available 24/7 to meet your needs. ows down the roof, under the blanket of snow, onto the eave and into the gutter, where colder conditions on the overhang cause it to freeze. Eventually, ice accumulates along the eave and in the gutter. 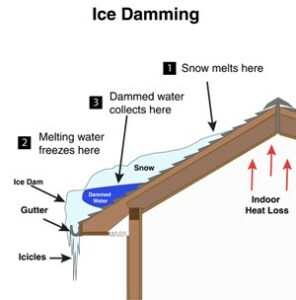 Snow that melts later cannot drain properly through the ice on the eave and in the gutter. Call the Snow and Ice Dam Maintenance and Removal Experts at Great Northern Builders today at 651.455.9371 or Contact Us below for a Free Property Inspection!